Microtubule-targeted drugs (MTDs) have been on the forefront of breast cancer chemotherapy. Classic MTDs, such as paclitaxel and their semisynthetic derivatives, have achieved considerable success in the clinical management of breast neoplasms. In order to improve the specificity and to reduce undesirable, dose-limiting toxicities of these drugs, a plethora of novel compounds are being synthesized and investigated in laboratories worldwide. Due to their crucial roles during cell division, and to the fact that the suppression of their innate ‘dynamic instability’ can arrest cell cycle progression, microtubules formed an attractive target for cancer chemotherapy. Kadcyla (ado-trastuzumab emtansine), Halaven (eribulin mesylate), and Ixempra (Ixabepilone) are three relatively-novel, microtubule-targeting antibreast cancer drugs. Kadcyla was developed by conjugating a very potent derivative of the natural product maytansine to trastuzumab, a HER2-targeted monoclonal antibody. Kadcyla is a double-edged weapon, that is, it prevents receptor dimerization to inhibit cell proliferation, and then it enters inside the target tumour cell by receptor-mediated endocytosis and ensures death of the cell. 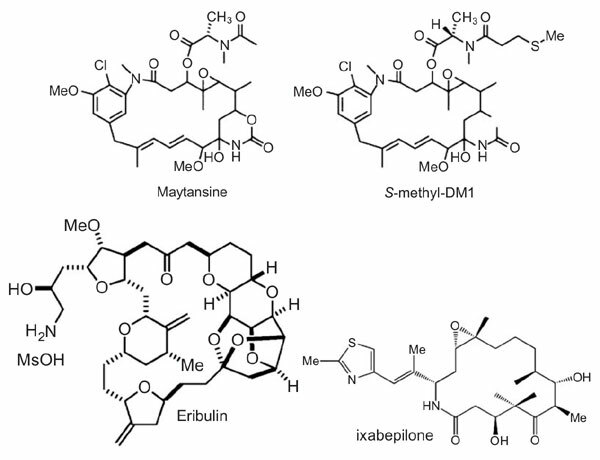 Halaven (eribulin mesylate), created by simplifying the structure of the marine sponge-derived molecule Halichondrin B, works primarily by suppressing the growth rates of microtubules and thereby inducing cell cycle arrest and cell death. Ixabepilone, the semisynthetic analogue of epothilone B, suppresses the shortening rates of dynamic microtubules resulting in cell cycle inhibition and cell death. In order to improve the efficacy and reduce drug-induced side effects, novel therapeutic strategies, including liposome-mediated drug delivery, are being investigated. Keywords: Microtubule-targeted drugs (MTDs), Maytansine, Trastuzumab, Ixabepilone, Semisynthetic. Keywords:Microtubule-targeted drugs (MTDs), Maytansine, Trastuzumab, Ixabepilone, Semisynthetic. Abstract:Microtubule-targeted drugs (MTDs) have been on the forefront of breast cancer chemotherapy. Classic MTDs, such as paclitaxel and their semisynthetic derivatives, have achieved considerable success in the clinical management of breast neoplasms. In order to improve the specificity and to reduce undesirable, dose-limiting toxicities of these drugs, a plethora of novel compounds are being synthesized and investigated in laboratories worldwide. Due to their crucial roles during cell division, and to the fact that the suppression of their innate ‘dynamic instability’ can arrest cell cycle progression, microtubules formed an attractive target for cancer chemotherapy. Kadcyla (ado-trastuzumab emtansine), Halaven (eribulin mesylate), and Ixempra (Ixabepilone) are three relatively-novel, microtubule-targeting antibreast cancer drugs. Kadcyla was developed by conjugating a very potent derivative of the natural product maytansine to trastuzumab, a HER2-targeted monoclonal antibody. Kadcyla is a double-edged weapon, that is, it prevents receptor dimerization to inhibit cell proliferation, and then it enters inside the target tumour cell by receptor-mediated endocytosis and ensures death of the cell. Halaven (eribulin mesylate), created by simplifying the structure of the marine sponge-derived molecule Halichondrin B, works primarily by suppressing the growth rates of microtubules and thereby inducing cell cycle arrest and cell death. Ixabepilone, the semisynthetic analogue of epothilone B, suppresses the shortening rates of dynamic microtubules resulting in cell cycle inhibition and cell death. In order to improve the efficacy and reduce drug-induced side effects, novel therapeutic strategies, including liposome-mediated drug delivery, are being investigated.